2-point static harness is designed to safely secure a passenger for transport in a vehicle. Unwin static harness is fitted with ATF feet which fit in any vehicle rail tracking. 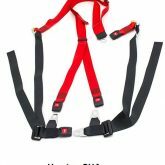 The harness is designed with black and red webbing; the black webbing forming the lap belt and the red webbing forming the shoulder harness which is clearly visible to the driver. 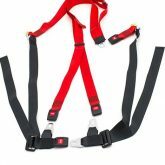 The two point static harness is suitable for passengers with poor upper body control.